Telescopic Lighting Technologies announces "Telescopic Ceiling Light Fixture"
PIGEON FORGE, TN – Telescopic Lighting Technologies, an innovative lighting company which has reimaged the ceiling light fixture, announces its market-ready patented “Telescopic Ceiling Light Fixture”. This new technology was developed by Founder and President Alvin Todd who is a resident of Pigeon Forge, TN and holds 28 patents. Telescopic Four Arm fixture. Image courtesy of TLT. Mr. Todd developed the lighting fixture as a convenient solution to maximize illumination and give residents the ability to fully customize the lighting fixture for each room’s needs, especially lighting tough locations, and personalize for each person’s individual design style. The “Telescopic Ceiling Light Fixture” fits where all standard ceiling models are installed, and rooms are fully lit by the extending telescopic arms. Each arm can stretch to 18” from the base. Not only can each arm’s length be customized to the full or partial extension length, each bulb’s position at the end of the arm can be customized and rotated 180 degrees for upward placement giving a chandelier look, to a horizontal position as an extension of the arms, to facing downward. The initial models are offered in two, four, six, or eight arms that allow all standard light bulbs to be used. Mr. Todd recommends using the new LED light bulbs to save energy and for the best illumination. Beyond customizing the arms and bulb positions, the lighting fixtures can also be personalized to complement room interiors. Customers have decorated their fixtures with flowers, lace, and other design elements. 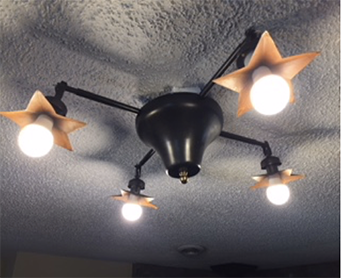 The company is testing out design lines, starting with the “Texas Star” which has five telescopic arms with stars covering the light bulbs. This design forms star shadows on the ceiling and creates an exciting ambience and mood for any room. “Telescopic Ceiling Light Fixtures” are designed for both residential and commercial applications. Each model can be installed in the same location as the standard ceiling units. No wiring modifications are needed and they can either be flesh mounted to the ceiling and or suspended depending on the room. Telescopic Lighting Technologies is on a mission to reduce energy consumption and illuminate rooms and the way we think about lighting. Proudly headquartered in Pigeon Forge, TN, the company is a subsidiary of the Country Craft Store. For more information on Telescopic Lighting Technologies and its new market-ready patented “Telescopic Ceiling Light Fixture,” visit facebook.com/TelescopicLightingTechnologies.